Like no other text in this field, authors Jose C. Principe, Neil R. Euliano, and W. Curt Lefebvre have written a unique and innovative text unifying the concepts of neural networks and adaptive filters into a common framework. The text is suitable for senior/graduate courses in neural networks and adaptive filters. 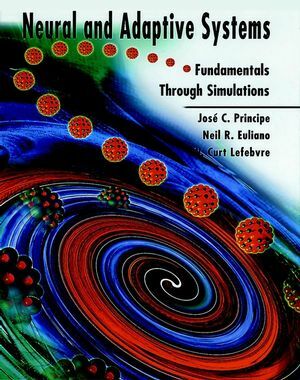 It offers over 200 fully functional simulations (with instructions) to demonstrate and reinforce key concepts and help the reader develop an intuition about the behavior of adaptive systems with real data. This creates a powerful self-learning environment highly suitable for the professional audience. Jose C. Principe, University of Florida. Neil R. Euliano, NeuroDimension, Inc.
W. Curt Lefebvre, NeuroDimension, Inc.
Data Fitting with Linear Models. Function Approximation with MLPs, Radial Basis Functions, and Support Vector Machines. Hebbian Learning and Principal Component Analysis. Temporal Processing with Neural Networks. Training and Using Recurrent Networks. The only textbook that is written around an icon-based neural network/adaptive system simulator. This simulator allows students to understand concepts by exploring the behavior of a system, instead of only through equations. In addition, students are given the opportunity to interact with the simulator to answer "what if" questions. Instructors also have the tools to expand their teaching ability by demonstrating features of the material and creating examples quickly. This book can be used in a computer teaching laboratory to create a unique and innovative teaching environment. In addition, because the textbook is written specifically for use with the simulator, the authors are able to present complex mathematical topics (e.g., most topics in adaptive/neural systems) using less mathematics and more conceptual explanations. The simulator and interactive examples are used to reinforce the concepts without the need for complex mathematical equations. This allows the book to be used with students who typically would not have the mathematical background required to understand adaptive/neural systems. For those interested in the mathematical rigor, the electronic version of the text has hyperlinks to the mathematical derivations and the printed version presents the derivations in sidebars. Textbook can be used for projects and realistic problems. The simulator is fully functional, allowing instructors the ability to specify their own data. Students can use it throughout the course as a resource for neural networks and adaptive filters. Professionals can also utilize the simulator to prototype ideas applicable to their work. Unique organization. The material presented in this text is uniquely organized for more efficient use with a simulator/computer. Much of the material is presented specific first and then theoretically generalized. This allows instructors to use the simulator early and often in each chapter. In addition, our authors have found that examples early in the chapter motivate the student to learn the concepts. Each key concept is presented quickly and efficiently and is followed by an interactive example where the student can exercise and experiment with their new knowledge. Bridges traditional pattern recognition and adaptive filtering. This allows students to develop a unifying view of adaptive systems within the same framework, using the same tools. This unifying coverage allows for more flexibility in organizing lectures. "The book would be an invaluable resource for those who are interested in doing research in the area of neural networks. Particularly, the book does a good job in unveiling the strength of neural networks in performing regression and signal processing calculations." "The authors give a balanced presentation of the theory and applications of neural networks with a small (but very useful) tilt towards applications. Using interactive examples, the book allows the reader to immediately investigate the practical aspects of neural networks."